To protect wood furniture, avoid exposure to extreme temperatures, direct sunlight and humid conditions. Do not place near heat sources or open windows. Plastic, rubber and hot objects can cause markings on a wood finish. Do not place objects directly on the surface, we suggest placing a strip of leather, cork or felt underneath accessories. For everyday cleaning, dust with a soft, clean cloth and wipe with the wood grain. You may dampen the cloth with furniture dusting aid or furniture care polish following the manufacturer's instructions. Wipe spilled liquids from the surface immediately with a lightly dampened cloth with the grain. For a more thorough wood cleaning, wash with a mild wood soap. Following the manufacturer's directions, use a soft cloth and wipe with the grain. Occasional polishing with a high quality, non-silicone furniture polish will enhance the beauty of the piece; avoid waxes or oily polishes. Scratches can be treated with scratch remover or furniture touch up sticks. Stone, metal and other non-wood surfaces should be cleaned with soft cloths and gentle cleaning products. Use felt pads under objects that may scratch the surface, avoid placing beverages directly on the surface. For spills immediately wipe by blotting. Classic country charm covers every inch of this French inspired four poster canopy bed. The oak frame has a rustic weathered finish that is complemented by elegant ivory fabric upholstery and antique silver nail heads. A muted metal canopy mirrors the styling of the wood posts and curve gently in a two tier canopy. 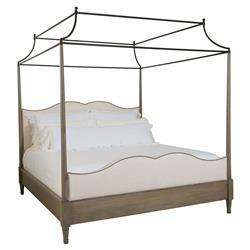 The stately silhouette of this king canopy will ground a bedroom suite and serve as a lovely focal point. Draped with a light canopy or unadorned, this bed is the perfect piece for an inspired bedroom suite.